Thank you, thank you, and thank you! Thank you to all the people who have constantly checked back here to look for updates. Similarly, I’m sorry to have disappointed you. Truth be told, there came a point in my journey where I could no longer find a balance between living my experiences and documenting them. Needless to say, I am still astonished by the support you all have shown me. Its especially touching considering I haven’t posted in at least a year and still so many of you have been stopping by! It’s quite surreal to me that people from around the globe have been checking the blog, including people from places I’ve never even been! I’m sure if you are reading this, you’ll be excited to hear that I’ve decided to take play catch up. So do check back frequently because over the next little while I’ll be going through old writings, pictures and videos and doing what I can do to get up to date. I hope each of you are going after your dreams and getting what’s yours! Rishikesh is the gateway to the Himalayas and the yoga capital of the world. When you first arrive, you can hear the sound of the Ganga well before you even see it. This place is the heart of Hindu pilgrimages. Every 12 years there is a Maha Kumbh Mela which is held in Haridwar. Haridwar and Rishikesh are sister cities that are connected at the hip by the Ganga river itself. The Kumbh Mela is the largest gathering of people anywhere in the world. Somewhere between 60 to 80 million people gather to bathe in the Ganga together. I had a chance to experience this and it is something of an experience. Still, for me, I prefer to find places away from the masses. While staying in Haridwar, I stayed at Swami Ramdev’s Ashram. Swami Ramdev to me, had just been a character who I had seen on TV in the west. Contrary to some of my uninformed opinions I held back home, I was rather impressed by his facility and all that his organization was working on. He has an impressive hospital set up where Ayurvedic physicians offer free consultations to anyone! Each day, hoards of people come for treatment. The cafeteria serves healthy and naturally delicious food. There is even a school that has just opened to teach students about Yog and Ayurveda. One area that I was impressed with was the research facility. His foundation is among the first groups pairing traditional yoga with modern science. This is unprecedented as Ayurveda and yoga have not traditional held much standing in the medical community. In an effort to broaden the reach of these practices, they have been conducting research to close this gap. One particular study I found interesting has proved through the scientific method that the practice of Pranayama brings balance to the right and left brain. Admittedly, I had never been one to practice yoga back at home. Still, if I’ve learned anything on this journey, its that I should always keep myself open to ideas. For the first times trying yoga, it was quite an experience waking up at 5am to do 4 hours of yoga in an outdoor tent with thousands of people. This is typically the format in which Swami Ramdev conducts his courses. Although the conference was intended for doctors who had preregistered in advance, I managed to squeeze myself through the bureaucracies. While staying at the complex, Patanjali Yogpeeth, I met two girls who were studying at the Yog school. I could never be quite sure how appropriate it was for me to be speaking to them as there always seemed to be judging eyes on us. I always do my best to be weary of cultural norms. In this case, the girls approached me so I simply followed suit. One of the girls, Komal, was really curious about where I had come from since it was her first time out of the village where she grew up. It was a big achievement for her family to see their daughter leave to study. Over the few days I spent there, I learned a lot about the simplicities of her life. She learned about the complexities of mine. One area she had been quite concerned with was her impending arranged marriage. I told her to push the lines wherever she could. I could tell that meeting her may have been a big moment for her because my words of encouragement seemed to open her eyes. One day we set out to the Kumbh Mela. Battering my way through the crowds was too demanding for my liking. If that wasn’t enough, there was sand blowing in all directions. To me, it was like a spirituality fair. I could relate it to a career fair I had once been too. The only difference were the spiritual leaders weren’t selling employment, rather beliefs. Each Swami had set up their respective camps. The ones that I was interested in were the ones with the smallest camp. Why would people seek out teachers who you can’t access anyways? I needed to escape. I looked around and noticed a temple at the top of a nearby hill. I asked Komal about going to the temple. She explained that there was a cable car that would take us up there. After finding a place to cross the river, we took the cable car and got to the top. It seemed to me as if this temple was offering religion in the fast lane. Komal bought an offering to take to the temple. We waited in a roller coaster style line up to arrive at the murti (statue of god). I will never forget the enthusiasm with which Komal offered the coconut to the pandit (priest) and the indifference the pandit showed when he quickly smashed it open and gave her the routine blessing. When we got outside, Komal was just about ready to head down to the valley. I told her to wait and offered to show her what my idea of a temple was. The thing is, temples in India are typically built at the tops of the most beautiful places. I knew that the real beauty of this spot could not be found within the confines of four concrete walls. We took a walk not more than 100m from the temple. It was at the edge of the hillside. From there, you could see all of Haridwar below. A birds eye view of all the various camps set up for each swami. I could hear all the voices below me chanting. Everyone was chanting different mantras at different times. From where I stood, it all sounded like one uniform sound. I thought to myself, if there were a God somewhere up there listening, it wouldn’t really matter what everyone was saying anyways. The thought affirmed my belief that the road to spirituality does not have anything to do with rituals. We had only spent 10 minutes in the temple and yet we spent the next 4 hours until sunset here. Nature’s temple. Back in Rishikesh, you can’t help but find yourself in a trance as you stare at the Ganga. Its a type of magic that cannot easily be described. Mesmerized, by the endless flow of water, it amazes me how effortlessly it flows. A constant flow of energy, like the blood in our veins. In our own lives, we can choose to go against the current, but quite soon, you’ll tire and eventually drown. Watching the flow of water, I considered the flow of my own life. Everything started to make sense. The magical Ganga – I spent many hours everyday sitting by the her shores. Whether I was playing tabla, practicing yoga, meditation, or simply drifting into thought, the place had its hold on my heart. In some parts, the river almost looks as if it is as still as a lake. In a way, it is – it never moves. Yet, you can also find raging white rapids to remind you of how fierce even a collection of water can be. Its one thing to stare at these white rapids and its quite another to experience it in a raft. One morning, I set out with my cousin Kunal and some friend to go rafting. I had already gone rafting once before with Kunal’s brother Rishaal, but its a thrill I just couldn’t get enough of. It was a bumpy jeep ride upstream. The morning mist ubiquitously blanketed the hills around us. Like a group of kids, we laughed and chanted Ganga Maya Ki JAI! While paddling through a series of rapids, there is a surge of adrenalin that feeds your pulsating heart. We arrived at one open stretch of the river where we all decided to jump in. With little hesitation we leaped off the raft as if it were a diving board. Jolted by the frigid waters, we splashed around in joy. As we screamed, I will never forget what I heard next. We were immediately silenced by the sound – SQUAAAAAAAAAK – SQUACK!! SQUACK! SQUACK! Looking over at the shore as we drifted with the current, I found the source of the sound. It was the most stunning peacock I had ever seen. Wild and beautiful he stood. Proudly showcasing his colours in all their glory. There amidst the foggy haze, I found myself in one of the most purest of human conditions – awe. On my journey, I have been to Rishikesh four times. I truly believe magic happens here. Each time I’ve had the fortune to visit this place, its been full of wonderful experiences and beautiful people. In fact, one such beautiful person who I met on my first trip to Rishikesh has come to be extremely meaningful in my life! Alas, that story is still in the making! Perhaps one for a future entry! Here’s a compilation that I believe captures much of what I love about Rishikesh. Enjoy! Hampi is a place that will forever hold my heart in captivity. What I expected would be a brief stopover for a couple days turned out to be quite possibly the greatest 26 days of my life! Also referred to as Vijayanagar, this magical paradise was once the epicentre of a powerful dynasty which ruled over all Southern India. Surprisingly, it is now an often overlooked tourist destination. Perhaps it was just that which allowed me to experience its marvels naturally and uninhibited. From visiting ancient ruins to exploring the site of 5,000 year old cave paintings, I never had to purchase one ticket or wait in a single queue. In this dreamlike destination, I was home. I spent countless nights sleeping under the stars, with no tent and only the flat rock below as my mattress. It felt as if this is how we were meant to sleep. Never having ridden a motorcycle before, I spent my days broadening my radius and riding through lush green rice fields with the backdrop of wonderful rock formations. It was upon arriving at these isolated rocks that I first learned what my feet were really meant for. Running full speed on instinct alone and jumping unbelievable distances from rock to rock, I felt like Mowgli in the Jungle Book. Hampi became my playground and the people I met there, whether fellow travelers, locals or children were gems to my adventure. There are too many to name, but I thank each of you! Dear Prasheen, THANK YOU SO MUCH:)!! Really enjoyed experiencing your enjoyment. I am enjoying Pushkar at the moment and will let go my way, paint on a wall:) Lots of love and light to your day and to your way! I now know why you didnt want to leave P, nice! WOW WOW WOW….i was feeling so depressed this morning with minus13 degrees in germany, but this video gave me all my energy back ..it really has the power to inspire..thank you so much prasheen!! the world needs more people like you !!!! hey babe …..the video its just beautifull……wish to teleport myself……..enjoy the present momentttt…love take care …. Great video Prasheen. You really captured the moment! Thanks. Hey buddy, I think I’m going to be on the next flight to India, and then the next train to Hampi :). Seriously dude, great video. hey, scamp in the hamp;) .. wicked video…how did you edit this ?! you going back there now? P – fantastic! The soundtrack was amazing too. Good for you man .. looks like you’re truly letting go .. enjoy! good work my man….the monkeys were pretty cool…I could imagine your reaction to them. Awesome video Prasheen! Seems like you really captured what touched your heart in Hampi! Outstanding! yes a reunion! 🙂 what a wonderful idea..
….ur living the dream buddy! enjoy the rest of your journey…. You truly are an amazing individual! HAMPI REUNION sometime, man, for sure!! EY MAN! I’m so greatful i met you, great man, great video, you really must have loved Hampi, me too, i just find an adjective to describe the emotion i got from this video, and the memories, definitely have we have to meet you again!! This is great! you know i love the part with the monkeys.. i am soo happy you finally gave them the water!! 😀 hugs. Goa is a place that you can really spend a while effortlessly. After drifting away from the Trance parties and the tourist hotspots, I found it refreshing to enjoy some downtime. Sitting on the beach, the waves crashing against the shores, you can stare into this endless infinity and daydream about anything that suits your fancy. I couldn’t help but wonder to myself, how incredible it is that the ocean never stops. Not even for a small break. A constant flow of energy, like a massive organism. I suppose in many ways, its awakening because just as we encounter hurdles in our own lives, we realize, that life won’t wait for us just because we want it to. I have often wondered if a place like this could keep me here on a permanent basis. Since I was a child, the beach waters have lured me like a moth to a flame. Perhaps I get this from my grandfather who to this day has been swimm ing in Durban beach on nearly a daily basis. Similarly, during my time in Goa, I have spent about 3-4 hours a day out in the water. Not on the shore, but out there, just drifting with the waves and cooking under the sun. I have the tan to prove it! So, would it be possible if I lived here and had my morning shower in the beach everyday? Could I actually become one of those perma-vacationers? I would get my exercise from a run on the beach and not in a gym. I would enjoy candlelight conversations in the evenings instead of TV. Hmm! Just the other day, I met a fellow from the US who was an antiques dealer back home. 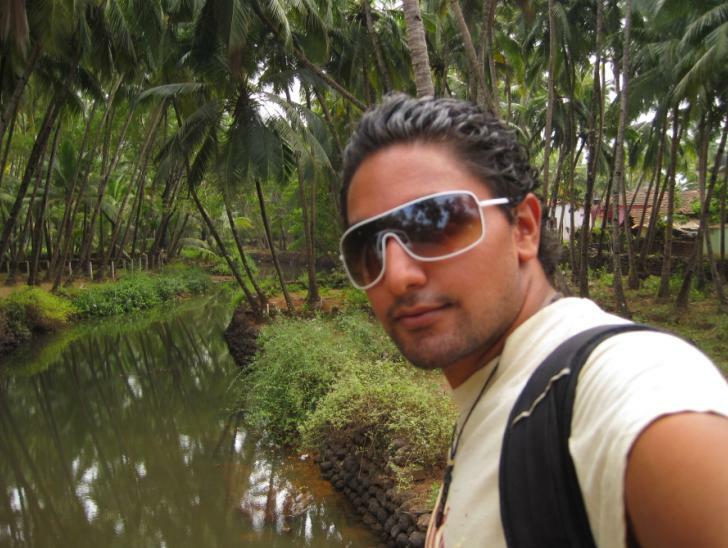 Today, he is living in Goa with his wife and son in a beautiful Goan home. He works as an interior designer on corporate projects, such as a new beach restaurant. I’m not saying it isn’t hard, a business is a business, but think of how enjoyable his downtime is! There are countless examples of this sort of lifestyle, but I often wonder if I could ever do away with my cityboy roots! Well, time will tell! One of my pet peeve’s is when you come back from vacation and people tell you things like, welcome back to reality or welcome back to the REAL world. India is a living breathing world here. Yes, it is not the world I grew up in, but there are real people here with real lives, and real lifestyles! A friend once told me that there is only one reality and there are no dualities. Its a thought provoking philosophy. In any case, I think I am well on my way to discovering my inner-self more and more here. I look at this journey to India as more than a vacation, but as a possible place that I could live and contribute here. After all, this land played such a role in making me who I am today, why should I not give a little back? I’ll see where my instincts take me. Now, I have changed the scenery. I am sitting and writing to you from a boat floating off the coast of Palolem beach. The water is gently splashing against the starboard side of the boat. The wooden boat, carved out of a mango tree, is a new experience entirely for me! Just a few minutes ago I saw two dolphins playfully swiming about 10 feet from the boat. It is the first time I have ever seen a dolphin in open water. Remarkable! You can’t help but smile at the site of these creatures! Now, its my favourite time of day; sunset. The time when the sky changes into an oil painting. Making myself comfortable on the boat, I sat there and enjoyed one of the most peaceful sunsets to date. The boat gently swaying from side to side this is a moment I wish I could have shared. If I stick my arm out towards the horizon, the sun is only one thumb width away from meeting the water. How many places in this world can offer such natural marvels as India. Each place I visit seems to yield its own unique flavour of beauty and culture! Lucky me. After an evening of dolphins and boating, I enjoyed a candlelit dinner on the beach and soaked in the ocean air. Making my way back to my beachfront hut, I stopped for a snooze in a hammock. I am not sure if it was the sounds of the waves, the swaying of the ocean, or the night sky above me, but I felt as though I was floating away. Its quite easy to let yourself go when you’re relaxing in a meditative paradise! The next morning, I made up my mind. Today is the day I am going to ride a scooter. Sure, I have never ridden a motorized 2 wheeler before, but you have to try everything once, right! How hard could it be? So I went to a few scooter shops and each one asked me about my prior riding experience. This seemed to be an area of concern for the first 3 shops. By the forth shop, I was convinced that I was going to spend a day at the beach and not riding. So when they asked, “have you ridden a bike before?” I replied, “yes!” Of course I meant a bicycle! A little white lie never hurt anyone! I sat on the scooter with this childish smirk on my face as he showed me where the gas and brake was. The engine started and with a jolt, I was off! I headed north along Goa’s coast without a destination or care in mind. I am pretty sure that I had a giant smile on my face throughout my entire 45 minute adventure. The goan landscape was beautiful. The road winded through farmers fields, waterways, bridges, dirt trails, churches, temples while the sun beamed down at high noon. With each turn, I became more comfortable and more daring! So what does it feel like riding a scooter for the first time? Well, for starters – I had no Idea that these things could go past 50km/h! Let me tell you, it is a rush hitting 80km/h on an open stretch of road. You couldn’t slap the smile off my face! Overtaking rickshaws, bikes, bicycles and maneuvering through people, cows, goats, and pigs – I felt alive! Of course, having spent months in India, you do know that people here drive on the wrong side of the road. By instinct alone, I kept veering to the right side of the road, until I remembered this minor rule! The last leg of the trip was a windy dirt trail. I’ve never heard of dirt scootering before, but I can distinctly recall being airborne twice! What a feeling! I finally arrived at my destination and parked beside a row of bikes. I was a little sad to dismount the bike and experienced a little withdrawal as I walked away! All that changed when I found myself on the most serene stretch of beach. Cola beach is an upscale retreat tucked away behind a row of palm trees with only a handful of people. There are few times in your life when you can just lose all your bearings and forget which spot on the map you’re in. For me, I wasn’t in India, I wasn’t in goa, I was in paradise! The water was clear, the drinks were cold, and it seemed like the perfect time for a walk. I walked on the beach and found a fallen palm tree which i turned into a jungle gym! There is nothing like exploring a paradise that you’ve never set foot in before without a person in sight! The next day, I still had the scooter. After my first day’s success, I felt like a pro! I thought about changing my scooter for an Enfield, but now the scooter and I had history. As I was heading out, I bumped into a man from Holland. He was as aimless as me and so we decided to head off together and see where we wind up. Its quite amazing how you can meet a complete stranger and then spend an entire day together like old friends. This never fails to amuse me, no matter how many times it happens here. The great part about meeting someone new is you can look at the world through a new set of eyes. Bert, was particularly interested in birds which is a hobby that I have never understood. When I came to India, I vowed to come with open eyes and try anything before judging it. There I was pulled over on the side of the road with a set of binoculars, birdwatching. I must admit, birds are quite marvelous animals. I managed to catch a glance at an exotic King Fisher. The only time I’ve ever seen such a beauty before was on the bottle of India’s most popular drink! Back on the scooter, there was a moment when I caught myself laughing uncontrollably. But in order to understand the humour, I’ll have to explain from the beginning. As happy as I was driving along the road, I was waving and smiling at everyone that I drove past. Often they would wave back and say hello and other times they would run up to me and ask me questions. One such time, I encountered a man and his little daughter. He signaled to me that he was going in the same direction as me and asked if he could get a lift. This was a REAL India experience. I don’t think that I found it funny that he was sitting on my back, or that his daughter was standing in front of me. What was hilarious to me was, I wondered if they would have asked me for a ride if they knew it was my first time riding a scooter! After another day of beaches and scootering, I returned to Palolem beach with a very hard decision to make…. To hammock or not to hammock? Stay Tuned: Rock Climbing in Ancient Hampi! Before we begin, I wanted to preface this entry with a few words. YES! I have been slacking. Over the last couple of months, I have not been a good writer to you. Since we last chatted, I have experienced more of India, than I ever thought I could in a lifetime. Selfishly, I’ve been keeping too busy enjoying my travels without taking the time to share these experiences with you. Oddly enough, I’ve received more feedback since having stopped writing than when I was writing regularly! It seems there are many of you who have been following the journey and have been eagerly anticipating my next post. Thanks to all those who are reading and for the motivation and kind words. I really am glad to hear you have been enjoying the ride! On that note, I do encourage anyone following to leave comments at any time. Please share some of your own stories, similar experiences, or write anything that would engage further discussion! In this manner, it makes it more interesting for me because I get a sense of what your thoughts are and this blog suddenly becomes more interactive! Okay, now for what you came here for. Grab a cup of tea and let’s catch up a little. (Seriously, feel free to go and make a cup of tea, as I just did!). Mmm nothing like a proper cup of Masala Chai! According to my last post, I left off when I was enjoying Leh, the roof of the world. I have since been to a slew of places. Jammu – the city of temples, Dharamsala – home of his Holiness the 14th Dalai Lama, Amritsar – the golden pride of Punjab, Delhi – the cutthroat capital of the world’s largest Democracy, Agra – the ancient land of the legendary Mughals, Rishikesh – the yoga capital of the world, Haridwar – home to Swami Ramdev, Varanasi – the source of Indian classical music and Darjeeling – a world of tea fields in the clouds. I could still smell the rich aromas of Darjeeling as I drove down from the scenic hilltop through endless tea fields. After enjoying a tremendous Christmas and sipping some of the world’s finest teas I had decided it was time to finish my tour of North India. Incredible as the North was, I thought it was time that I go to a place where I didn’t need a scarf and jacket – after all, I am in India! I packed my bulging backpack and made my way to Bagdogra airport, a couple hours outside of Darjeeling. The plan was simple, fly to Mumbai and spend New Years with my cousins. When I arrived in Mumbai, I encountered a strange emotion. Returning to Mumbai felt both foreign and familiar. Before I left Mumbai two months back, I had very quickly made the flat in Bandra feel like home. Seeing how the flat had changed did not feel like home at all! It was great to see familiar faces, but the place had changed. Somehow, when you leave a place behind you expect to return to familiarity and yet even in a short while, it can all seems new. Perhaps Mumbai hadn’t changed and it was me that had changed my perspective. This is what two months of playing hopscotch in the north is very capable of doing to you. Physically, I had certainly changed. I had shed a few pounds and I had decided not to cut my hair. Beyond the physical changes, perhaps it was just that coming back to Mumbai now felt like I was returning to the ‘real world’ after I had gotten used to spending my days on the road. The chilly adventure through the north was riveting and throughout my travels, I was sure to encounter new life experiences each day. Life in Mumbai would surely feel like a return to homeostasis. When it was all said and done, all I had to recall the journey was a handful of trinkets. A marble elephant with its trunk upward for good luck, a wood carved miniature of a shikara boat from Srinagar, a shawl from the Golden Temple, a yak wool shawl from dharamsala, a Tibetan prayer wheel from Leh, cheap sunglasses from Delhi, traditional chappals from Agra, a wooden chessboard from Rishikesh, yoga books from Haridwar, my Tabla notebook from Varanasi, and a silver tea set from Darjeeling. It’s sad to think that this portion of my travels had come to a close. Funny how time flies even when you have all the time in the world! This blurry picture depicts the xmas tree with toilet paper snow! Beyond the handful of items I collected, I took away memories from each of these places that I won’t soon forget! The people I met were gifts to the trip. Each of them added an ingredient along the way and without which, the recipe would be incomplete. It’s so lovely to share pieces of yourself with complete strangers. Miraculously, strangers can feel like family when you are all in the same boat. 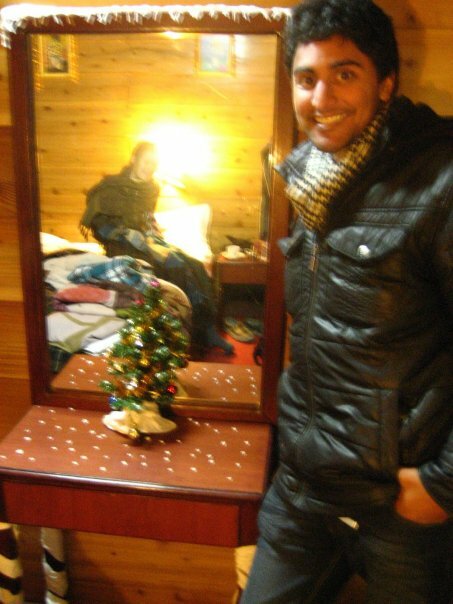 For instance, Spending Christmas in Darjeeling included decorating a proper Christmas tree, building a snowman (made of toilet-paper), a Christmas dinner, singing Christmas carols, and gift-giving. All of which was with a couple fellow travelers I met only a few days prior. As lovely as it is to meet new people and enjoy new connections, it is equally unfortunate that there comes a time when these moments must become a memory. Many of the people I met, I may never see again in my life, and yet what may have seemed like such an insignificant moment at the time, could offer rewarding life lessons in the future! consistencies in our life to keep us sane. Whether those consistencies are going to that breakfast spot every morning, or going to work each day, or settling down in one place, finding a mate. Eventually, if you follow this road long enough, you’ll find yourself in a life of routine. How mundane. Is this all we were meant for in this world? How is this any different worker bees in a beehive? If during all this travel, I find myself in a state of consistency, then am I at at risk of making life mundane? Just then, without hardly having a chance to finish my thought or settle, an impulsive decision was made. Along with my cousin Kunal, we would head to Goa for New Years Eve. Sure enough, the decision to venture to Goa would defy all the consistencies which I was preparing myself for in Mumbai. I figured I would first head to Goa for a few days to bring in the new decade and come back to Mumbai to make arrangements for my tour of South India. In lieu of that, I dumped most of my things in Mumbai and packed only a pair of shorts, a bathing suit, jeans, a couple T-shirts and a toothbrush and set out for the open road! Quite literally in fact! Oh, didn’t I mention? This was going to be a road trip. I’ll admit, I was a little skeptical at first, but in the end, we weren’t about to give up a chance to enjoy an India road trip! A friend had offered us the ride and holding true to Indian Standard Time, we set off just before dusk. Off we went, into the night, windows down and music up. In the middle of the night, we took a break for some Chai and waited to meet up with other Goa-bound travelers. It wasn’t that we were looking to socialize at this hour, but we didn’t 100% know the route so following another team of traveler’s seemed clever. The road was a blur between the ubiquitous and dark of night. Eventually, we had to take another break for some food and fresh air. As we were relaxing by the car, a voice emerged out of the darkness and told us we should get inside the car to avoid the guard dogs. Moments later we watched as a handful of Dobermans conquered the area! After a short nap, we were off into the morning fog again. Next stop, Goa! Arriving in Goa, you can smell the ocean air. Instead of the things most people might prioritize when arriving on December 31st, such as finding accommodations or planning the evenings festivities, we opted for our own priorities. Swim, drink, swim, eat, swim, frisbee, you know – the important stuff. Somehow things just managed to work out as it usually does. We ended up finding a hut which was situated right on Morjim beach in north Goa. It was quaint and had a pleasant straw house charm to it. Something like a house out of the Three Little Pigs. Sure I saw a rat or two in there, but you tend to overlook these minor details when there aren’t any other options! 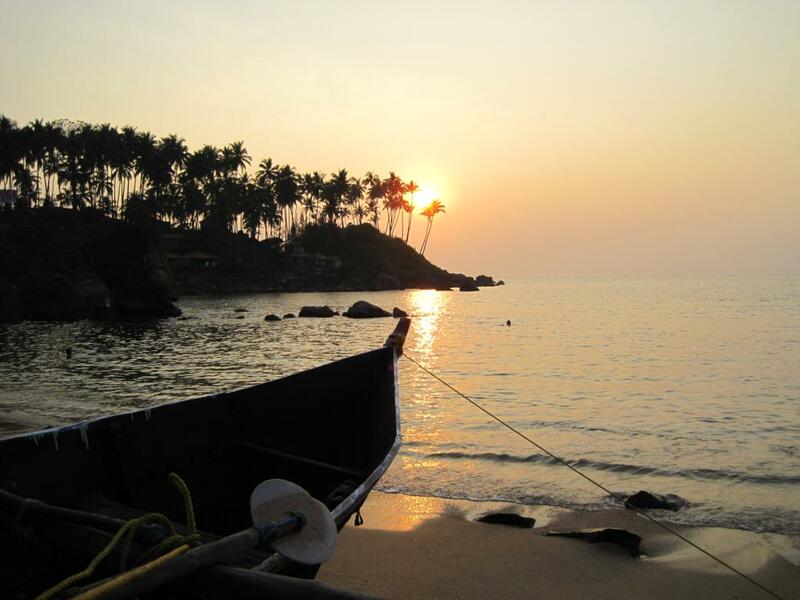 As the sun went to sleep over the Arabian Sea, Goa began to wake up. This is the Goa, after the Portuguese, the Goa away from the hippies. It was the Goa of New Year’s eve with non stop Psy Trance. This is the sort of music which you could have a jackhammer blasting right beside you and it would make no difference. In short, it wouldn’t be music you would find on my top 50 most played iPod list. Hoping from party to party, Goa is the one place where you can meet the whole of India in one place. I am certain that half of Mumbai, Delhi and Bangalore were in Goa right now. Because of this influx of people, you can feel this energy circulating through the air and into your soul. Everyone you meet is in the mood for dancing, singing, partying, mingling, and misbehaving. Admittedly, I was taken aback by the beauty of the beach as well as the beauties occupying it! Oddly enough when the clock struck 12, it did so by surprise. I found myself alone in a crowd of partygoers. It’s funny how in these moments you could be surrounded by many friends and yet if the people who really count are missing, none of it matters. I looked up and saw the partial eclipse of the full moon. How spectacular! I thought of all my loved ones individually and felt connected to them knowing they could see the same moon I was seeing. Happy New years to each of you! May you find all of those things which you deserve in the coming year. I hope each of you have the courage to go after your dreams! That evening I wound up spending time on the beach with new friends at a campfire enjoying some good laughs and good times. I woke up to find that our straw hut was hardly of any use to me as I slept just fine on the beach! Upon returning to the hut, I wished Kunal a happy new years since he had somehow managed to sleep before midnight for the second year in a row. Later on, Kunal and I headed out for a swim. There was something magical which occurred during this swim. Swimming out to sea, well off into the distance where we could no longer touch the sea floor, we lay there and floated for what felt like half the day. I even have the tan to prove it! As we lay there, roasting out at sea, I enjoyed the chance to catch up. It had been long since Kunal and I had some quality time. As we floated there doing ridiculous things from communicating under water to air guitaring we came up with an idea. The idea was to do something that I hadn’t done in a long time. Pray! It happened when we stumbled on a topic about the existence of God and the role of faith in the modern world. I thought why not sing the Hanuman Chalisa (a Hindu devotional poem) for good measure. I think a part of me wanted to sing it in full just to test if I still remembered every verse. This was when the magic happened. As we floated lifelessly, and sang verse after verse without a hitch, something came out of the water! It was a foot long fish! Jumping out from right between us, it flew over Kunal’s torso and splashed back in to join the school of fish below. We both paused with blank faces and thought about what just happened. Could that have been a sign from God? An awesome coincidence? I like to think it was just plain magic! It wasn’t until our hands were pruned that we decided to head in. I couldn’t picture a more fitting way to start the first day of the New Year. In the days to follow, a few friends that I had made had invited me to join them at their homes. It was such a privilege being invited to these beautiful homes. It is a shame that my camera was destroyed in Darjeeling or I would have surely offered a handful of pictures to accompany my narrative. Nevertheless both of these homes included enchanting terraces where I enjoyed spending quality time with my host(s). It certainly makes for a beautiful setting when the backdrop of the terrace so happens to offer inconceivable panoramas of Goa! After a few more days of lazing in the sun it would seem that my adventure in Goa was over and I would head back to Mumbai. Arriving at Goa airport with Kunal, he had planned on heading back to Mumbai and had already arranged for a ticket. I on the other hand was considering buying a ticket at the counter and jumping on the next flight! I’ve always wanted to do that. It turned out there were no attractive flight options until the next day. In the end, I decided that I would continue my journey south from here. After all, what was really the point of going back north to Mumbai only to head on south again! My guess is it will be quite liberating walking around with only 5 Kilos of luggage. With a quick cheers, Kunal was off and I jumped in a taxi – destination South! I came, I saw, I conquered North India with a backpack. Let’s see what adventures lay ahead in south India as I venture on with only the mere essentials in my knapsack! Stay Tuned: Scooter adventures in South Goa! Leh is nestled in the Himalayas between the Ladakh and Zanskar mountain ranges. Arriving in Leh, I was already at an altitude of 10,500ft above sea. Taking a few steps on the first days feels as if you are jogging in a marathon. Altitude sickness is an ever prevalent concern for foreigners. I’m not sure if it was the altitude itself or some form of food poisoning, but the first couple days in Leh I was bed ridden. The incredible thing about this place is the immediate warmth of the Buddhist people. They are disarmingly friendly to the point where it almost seems unnatural. While I was ill, I was staying at a guest house and the lady of the guesthouse literally looked after me the whole time. This was the kind of hospitality you would expect from family and loved ones but not a complete stranger. I am quite confident that it was her secret soup which cured me. It’s unfortunate enough to fall ill while traveling, let alone have it be in the roof of the world – as the locals have dubbed Leh. My first evening outside I went to an Italian eatery. This restaurant had the backdrop of mountains and such friendly staff. One such employee was Surinder, who I immediately befriended. He told me the story of how cultural difference make dating impossible here and how he sees a great number of tourists coming through this restaurant. He went on to tell the tale of his Australian girlfriend. Truthfully, he met her last year while she was vacationing and has not seen her since. He explained that the owner of the restaurant retreats to the south to avoid the cold months and he is left in charge. One thing I found amazing about his lifestyle was where he lived. It was outdoors, behind the restaurant, and while I’m sure it was freezing at night, the view was out of this world! One of the greatest parts about traveling is hearing people’s story. Each new person I meet has such vivid tales which can often be more entertaining than some of Bollywood’s greatest! The next day I set out to Shanti Stupa. A stupa is a Buddhist place of worship which literally translated means heap. They are monuments created to represent the various stages of Buddha’s life. Stupa’s were originally made as very basic round clay structures, but more alluring than the actual structure are the locations where they are found. The 1hr trek through northern Leh and a demanding climb up the crumbling, rock-formed steps led to this particular stupa. It was easy to see what makes this place holy. Later on that evening, back in the central market I found myself sitting on the steps in front of a the local monastery. During the day, the place is packed with followers praying and being fed simple meals. At this time, there were only a couple of kids horsing around and a few stray dogs wandering around the courtyard. The two kids reminded me of my own childhood. My cousin and I would often be caught misbehaving in a similar fashion. Like the mythical brothers Ram and Laxman, these two brothers had a bow and arrow on their back. Their clothing looked like they hadn’t changed in days, and yet in their simple lifestyle they found such joy in firing arrows at each other and targets. Although the handmade concoction was rather makeshift and the arrows were simply branches, I couldn’t help but share in their amusement. They ran around hiding behind trees laughing and shooting and as I sat in the midst of the crossfire, my only thought was to join in their escapades. Just then, in the heat of the action, a fatherly figure came by and scolded them and I felt as if I too was being reprimanded for sharing in the experience. He continued to explain that it was dinner time, or at least that is what I gathered from my attempt at a translation. Their dinner consisted of two handfuls of plain basmati rice which they devoured face first! I offered them the rest of the mango juice I had just bought and they stared at me in astonishment. I suppose it was such a rarity for them to ever indulge in a beverage aside from water. As the eldest brother hesitantly accepted my gesture, he took the liberty of rationing sips amongst his brother and other friends who emerged almost instantly. It almost breaks your heart to witness this natural joy being derived from what I would consider such a staple. The next morning, I left at the break of dawn on yet another Himalayan road trip. The four hour journey led through one of the world’s highest motorable passes at 17,586ft above sea. Driving through the snow-capped mountains it seemed as if fortune had to be on your side to successfully maneuver the drive. We stopped several times to assist many other snowbound vehicles. The views en route were almost as tranquil as my destination, Pangong Tso (Tso is Ladakhi for lake). Here, the crystal blue-green lake marks the edge of India and as the lake separates it from China (panoramic view). Upon arrival, 0°C fell to minus 10°C. Draped in layers, I stretched my legs at the bank of the lake and stared at a different world across the water. This place was blissful and yet, as I sat there one thing caught my attention; the absence of everything. Not simply the absence of human life, but all forms of wildlife as well! With the exception of a few yaks on the drive in, there was no civilization in sight. In the invitingly clear water not even one fish could be seen, in the sky no birds were soaring, it was baron and silent. The only sound was that of the gentle wind induced waves clapping against the icy shoreline. I find myself thinking about what purpose I have in this world. When I looked around at my surroundings I felt insignificant by comparison to the grandeur of this land. In the short time I have here, how can I add value and colour? Here in India, I am immersed in a world of faith and it seems that people here choose to define themselves by which religious sect they follow. In other instances, people identify through their professions. There must be a way to build an identity and find meaning without the association to such groups. I believe that at the moment of birth, none of us have a profession, a religion, a nationality, or even a destiny. These are all elements of our being that we can either be given or can choose to find ourselves. This journey through India is also a journey into myself, and in doing so I shall hope to discover many of these answers. One thing I could be certain of is the best religion and the best nation is that of humanity. I knew this because sitting there at the “border of India”, it was easy to see that like most of the aspects of the world, this border was man made. Needless to say, I was privileged to have found this untainted land. The handful of tourists who also braved the journey stayed at Pangong Tso for only an hour or so before retreating to nearby towns or driving back to Leh. I opted to stay in the only village that occupied the shoreline. In the summer months, perhaps 100 people could be found here but now as the winter encroached, there were no more than a dozen. The family I stayed at lived in a room that was bout 8x10ft. It had all the essentials, such a fire pit stove in the centre of the room, and 3 mattresses lining the perimeter of the room. A small coffee table and a rack for kitchen pots on the wall, this all-purpose room, was the epitome of living in simplicity. It was more than enough for this family of three to live a life full of beauty. The mother, Lhamo, had been gifted this house by her father who seasonally lived near by. Her husband, Gurmeet inherited the place through the marriage and two years ago they brought life to a baby girl, Patmayinder. There was a certain harmony to their lifestyle. During the day, Gurmeet would be out doing an endless amount of yard work or visiting the market on foot for supplies. Lhamo would make the family new sheep-wool clothing, cook the meals and look after Patmayinder. At meal times Gurmeet would collect the wood and ready the fire for cooking. Rice and curry was the daily choice for lunch and dinner and omelets and toast was the daily breakfast. Their house had two other rooms which they reserved for visitors and charged a mere $3Cdn per night. Due to the cold, there was no such thing as sleeping in. They would rise and sleep with the sun in order to maximize daylight hours. I was fortunate enough to be invited into their room to enjoy an evening through their eyes. Patmayinder was simply adorable. Her smile radiated through her frostbitten cheeks. Although their home itself was minimalistic, their backyard felt like it was the universe. My metropolitan condo balcony seemed like nothing in comparison. Perhaps this was the tradeoff for my so called luxuries. At supper, the little Hindi that I could speak offered no comfort as they only spoke a Ladakhi dialect. In lieu of this, the evening was full of hand gestures, body language and a fair amount of guesswork. I played copycat with Patmayinder for a solid half an hour. Her fascination with the stranger in their home was nothing in comparison to her curiosity as to why I was copying her! I thought to myself about how universal the concept of copycat could be that it transcends all language. Soon after, we were joined by my driver, Namgyal. I opened my jacket pocket to reveal a deck of cards and had the whole room fixated on me as I performed a series of magic tricks. Once again, spoken word was not required for this activity and as it turned out, they all knew how to play rummy. We all played game after game and even patmayinder joined in the fun by eating the box of cards. Before bedtime, it was customary to pray, and they lit a candle illuminating the 14th Dalai Lama in a small shrine. Various prayers were recited and I respectfully followed along their gestures. How wonderful the experience was consisting of strong elements of family and culture. Patmayinder curled up against the pillow and asked Lhamo to come sleep with her. Although I could only deduce this exchange of dialogue, my theory was affirmed when Lhamo complied and serenaded Patmayinder to bed. This was my cue to retire to my quarters, however Gurmeet insisted I stay for one more cup of tea. I obliged. Stepping outside, the moonlight lit up the entire lake and valley. The moon appeared full and beamed proudly among the myriad of stars. I was mesmerized. In the Morning, I was the first to wake up; even earlier than the sun. I ventured out into the frosty air and caught what was easily the best sunrise on earth. With each passing moment the shadows on the mountains behind me receded and the light approached the valley where I stood. Finally, in fashionable timing, the sun made its grand entrance on stage left. Peaking out of the mountaintop, the sun could be seen mirrored on the glistening water below. Suriya Namaskar! While walking the streets earlier, I had such an uncomfortable feeling. There seemed to be an excess of heavily armed soldiers every few feet along the main roads. When I returned to my houseboat, I was already anxious from but I couldn’t help but wonder what the dogs were uneasy about. Were they foreshadowing something terrible to come? Every so often a military chopper would flyby overhead and there I was lying in bed staring at the ceiling, eyes WIDE open! To my relief, as sure as winter follows autumn, the morning came and I was grateful to wake up! It’s strange that we take our days for granted and simply assume that each morning, like the sun, we will rise. With that, it was time for me to hit the road! I made arrangements to head east. My ultimate destination would be Leh, a Buddhist town in the most northerly region of India; Ladakh. I would be driving through the world’s most grueling mountain ranges, the Himilayas. The drive itself was gut-wrenching and I distinctly recall hitting my head on the roof numerous times! At times, I could have sworn that the icy, stone covered “road” was actually narrower than our SUV! That aside, the drive was unimaginably beautiful. The first stop was Sonamarg, a glacier which stood at approximately 10,000ft above sea. A panoramic scan of the horizon would yield vast autumn meadows with mountains standing guard in each direction. Upon arrival the place was simply breathtaking and quite literally at this altitude each breath counted as two. Stepping outside on snow was a new experience, and one I did not expect from India. 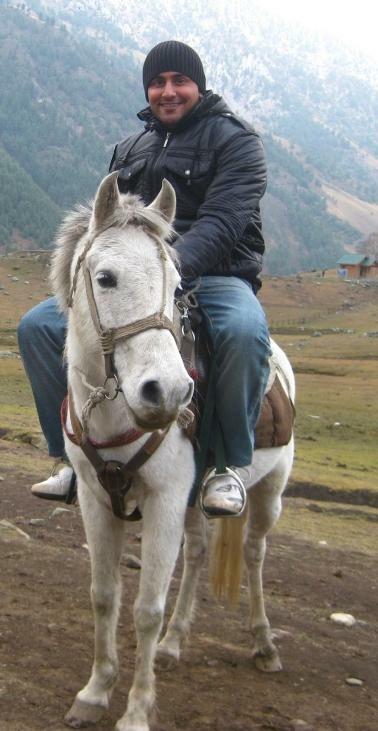 I opted to take a horse named Raju to the base of the glacier. I thought to myself how was I so fortunate that lady luck had smiled on me once again? Like the marketing campaign goes this was truly Incredible India! There was an open pasture which I knew was my calling. I gave Raju a nudge and the trot turned to gallop. Off we went, full speed ahead, frigid air rushing at my face, and I felt as if I was a jockey on a racehorse. In that moment, I could really feel that I was alive and yet it had all the ingredients of a dream. Reality recurred when my guide who was on foot finally managed to catch up to me! I was enjoying all aspects of the ambiance with the exception of this strange neighing noise that the guide was making. I think he thought he was a horse whisperer and could literally communicate with Raju with full fledge horse mannerisms. No matter, we eventually reached the base of the glacier my frozen hands were greeted by a small boy named Sameer. For 5 years old, this kid was really mature and told me all about the history of the land and the village people’s lifestyle. All of this dialogue was in plain English which even his parents didn’t speak. There was a nearby tent where his parents offered me a warm cup of chai. Let me tell you, it was one of the most rewarding cups of tea I’ve ever had! I climbed a rock which stood at around 20 feet high and took my seat. I’m not sure how I always manage to find what seems like the best rock in the world, but I certainly wasn’t complaining. Shortly afterward, my camera battery died, and just as well, this was one for the memory books anyway! On the way back, I could see the water from the glacier trickling down towards the valley. On one side the world around me was covered in trees shedding leaves and blanketing the world with autumn colours. On my other side, the snow capped mountains towered above the haze of clouds. It was as if I was physically witnessing autumn brushing shoulders with winter. Wow! I smiled the entire way back like a little school boy. When I returned to the valley, my driver had told me a list of hotel options, and yet the most enticing option was to stay with a friend of his. I was ecstatic to be able to stay in a local village home and experience an evening filled with culture. This raw Kashmir evening led me to a small village about 10km away. Situated amidst the mountains, there were only a couple dozen houses here. The house where I stayed was a gem situated a short walk from the banks of the glacier river. It was a simple house which consisted of one main room with no furniture and a pile of blankets. 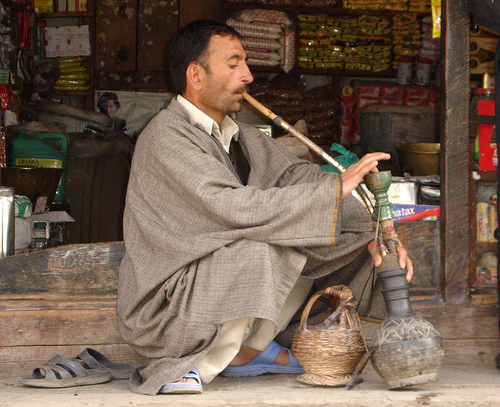 Kashmiri man wearing a pheran while keeping warm from the kangri (in front of the pipe). The father of the house, and his son were relaxing in this room and I gladly joined them. I am certain that the idea for the Snuggie came from Kashmir. Almost everyone here could be seen wearing a Pheran, which is a warm woolen poncho styled kurta. Underneath they would hold a Kangri, which is a wicker pot containing hot coals used to keep warm. Kashmiri’s also refer to this as a “winter wife” because in the winter months, they never leave your side! A short while later, a girl came in the room with her head covered and gave us rice and curry and then left as quietly as she came in. I gathered that she was the son’s wife, and so I asked if she had eaten or wanted to join us, and the men laughed. I hadn’t realized that I made a joke! It seemed that women in these traditional villages have a very different lifestyle and are isolated from so-called male activities. Needless to say, I wasn’t about to judge or push the issue further. The night finished off with yet another wow moment – a bathroom break! No, no, not the bathroom itself, which felt and reeked like a sewer. The moment occurred on the way to the outhouse. Standing outside, I must have stood there in the cold for easily an hour in awe at the moonlit valley. All the village must have been asleep by now, and here I was standing in the middle of a stone covered field. A handful off quaint country homes behind me, and the universe above. It was as if I could see every star in existence dancing across the sky. The only clouds in sight were small cartoon-like clouds which seemed like they were being puffed out of the peaks of the mountains around me. Wow! The next morning I would set off for the remaining 10 hour leg of the journey to Leh. What wonders this world can offer for who are adventurous enough to find them. It was an agonizing trip with windy, rocky mountain roads the whole way, but it was well worth the price to drive through the top of the world! 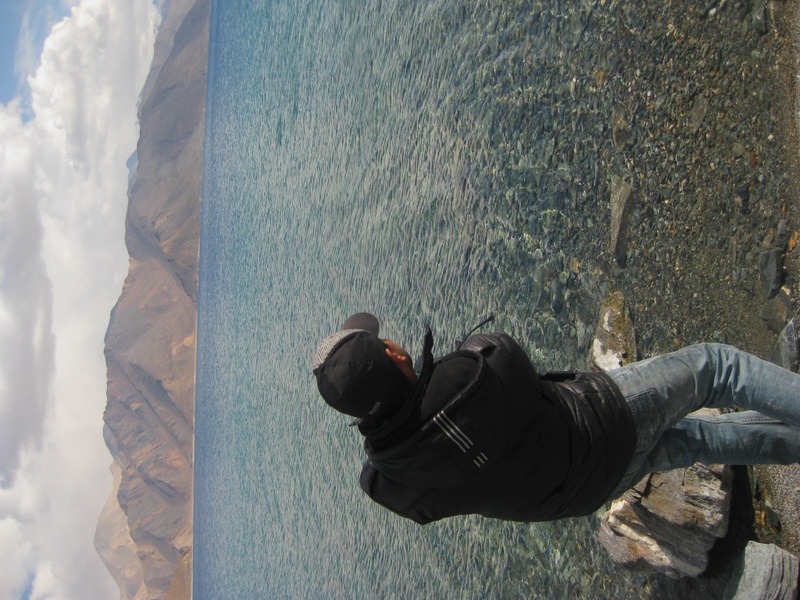 Stay Tuned: Leh and Pangong Tso to come! The splendor of Srinagar is captured in the beauty of Dal lake. I am currently sitting on a floating canopy bed known as a Shikara. Stretched out on the cushions, this is one of the most pleasant experiences imaginable. I feel as though I’ve actually traveled back through time. I can picture ancient Egyptian royalty traveling in a similar fashion across the Nile. The Shikara driver sits at the rear of the boat and uses a spade shaped ore which adds to the soothing ambiance with each stoke. Autumn colours line perimeter of the lake. I feel utterly fortunate to have come here! Sadly, its not a stretch of the imagination to consider why Kashmir is worth fighting for. This is strictly from a raw beauty perspective. I won’t attempt to comment on the complexities of the struggles historically. Needless to say, there is much to be ‘won’ by the victor of such struggles. The journey led me to the first stop where I was offered to water ski. I do use the term water ski loosely. This India version of waterskiing involved standing on a cracked piece of wood and being tugged by a boat with an inconsistent motor; respectfully, I declined. Later we stopped at a floating market, literally there was a shopping complex in the middle of the water. I was sure that the Shikara driver took a commission for anything purchased, having brought me there. No matter, I almost went on a shopping spree until I realized I left my wallet in the houseboat. Just as well, what would I really do with 10 hand-woven shawls? That evening I met Vipul, the friend I had made on the plane. He was from Punjab, though he lived in Gujarat. He worked for his family textile business and was in Srinagar to collect money from his non-paying clients. Had I been in Srinagar longer, I would have loved to tag along to one of his meetings to see how real India business is conducted. He ended up telling me how he was dating a girl who lived a couple hours away from him. Apparently she was much more serious than he was. Understandably, marriage was not his choice to be had. As did his brother, he would soon have an arranged marriage where if lucky, he could pick from the candidates which his parents proposed. I was astounded to find that he had no issues with this at all. I thought of all the times people had heckled me at Canadian dinners for being a vegetarian, and my defence would be the same. It’s how I grew up, it’s the only thing I know, and I have no desire to change this aspect of my life. So as outlandish as his views of marriage were for me, I could also understand his perspective. On the walk home, much of the city was closed with the expected visit of Manmohan Singh, India’s current Prime Minister. Nobody seemed to be able to explain why his arrival would mean city-wide strikes. Vipul told me that earlier in the day, civilians were throwing stones at the military, leading to one civilian being killed. As Vipul put it, “it could have been worse.” It is an eerie feeling walking the streets after dark with soldiers holding automatic weapons – finger on trigger – posted every fifty feet. Most people here tended to not make direct eye contact with the soldiers and I followed suit. Upon returning to the houseboat, the houseboat owner said to me, “If there’s anything you need, just ask.” I naturally replied, “thank you, I will.” He repeated himself with emphasis on “anything.” Curiosity led me to ask what on earth he was talking about. Alcohol, hashish, and many worse vices were implied. Although he didn’t come out and say it, I was disgusted at how matter of fact he eluded towards women on his list of what could be offered. Hmm, perhaps I do need a drink! That night was particularly cold and keeping warm while sleeping involved using my own sleeping bag as well as the provided blankets and a few hot-water bottles for good measure. I woke up the next morning excited to go outside and bask in the morning sun. To my disappointment, it was nowhere to be found. Since most of the city roads, shops, sights and arteries were closed in lieu of Manmohan Singh’s arrival, I opted to take a lengthy Shikara ride. Besides, keeping a low profile on the lake wasn’t a bad idea today. This time, I armed myself with a scarf, toque, and a fleece blanket. The Shikara drivers son, Akip, came along for the adventure. He was a cute five year old kid, and we made funny faces at eachother through the gap in the canopy. Okay, truth be told, I made funny faces at him. I stopped writing in my journal and drew a picture of the Shikara, vaguely depicting him, his dad, and myself. Then he warmed up to me and wouldn’t let go of the picture for the rest of the trip. Even when we stopped so he could eat, his dad fed him while he continued to hold the food-covered picture. Something about kids lights up my world, they are full of curiosity and innocence and quite easily amused. We could all take a lesson! En route, we were hailed by a military boat. After checking our identification, they advised us to turn back and not to come back. I thought the journey was over and we were obliging when we seemingly took an alternate route to arrive at the Old City. It was like a picturesque journey through Venice. Admittedly, I’ve never been to Venice, which only meant that this had to simply be better! See for yourself in the gallery below! Stay Tuned: The grueling journey to Leh is still to come!